Are you looking for eco-friendly roofing options? Not sure what kind of roof or what look you’re going for or even where to start looking for such a roof? 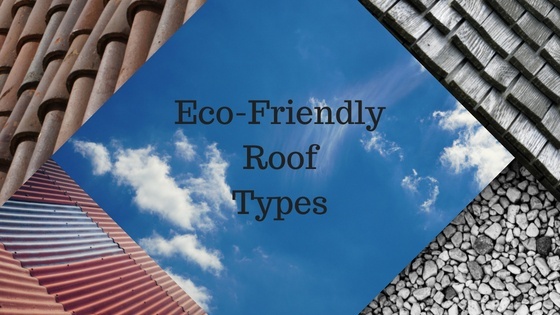 Today, we’ve compiled all of the best options for eco-friendly roofing so you’ll have plenty to choose from! Cool roofs are coming to be more and more popular. The materials that create this roof consist of a mixture of white glue and white gravel, which, when combined, reflect the sun’s rays, thus reducing the amount of heat that comes into your home. Less heat coming into your home means there’s less of a need for air conditioning, which will cut the need for electricity and in turn save you money and save energy! Did you know that a metal roof can last you 50 years or more? That’s right! A good metal roof not only saves you money on regular replacements, but also reflects heat and keeps the electricity bill beautifully low. If you’re not a fan of the “metal roof” look, you can get a roof coating that resembles granite. Nice, right? Clay Tiles make an excellent energy saving alternative to a typical shingled roof. They’re definitely more popular in desert areas due to the fact that they keep heat out and keep cold in with their insulating pockets above and below the roof. If you’re looking for aesthetic beauty while saving energy, this is definitely the way to go. Wood shingles can be made with recycled and repurposed wood. They generally last fifteen or twenty years and look fabulous, too. These are making a comeback when it comes to roofing just because of how environmentally friendly they are. If you’re looking for eco-friendly roofing options you will love decades from now, our selections listed above should definitely be on your list of roofs to “Check out”! Don’t forget to tell us what you like about your roof in the comments.